Sulfate free shampoo with encapsulated avocado oil, ceramides, and fatty acids that penetrate and adhere to the hair strands to promote softer and healthier hair. A combination of rich peptides and vitamins nourish scalp, helping to improve the hair growth cycle. 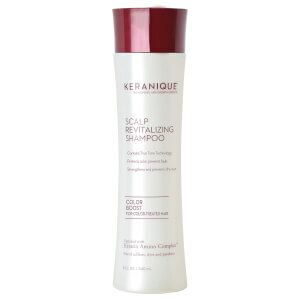 The ideal blend of moisture, softness, body and volume for thinning or dry, damaged hair. Stimulates the hair follicles for optimal nourishment. Leaves hair ultra-clean as it clears away impurities at the follicle level to improve penetration of scalp treatments. Massage into wet hair and scalp. For best results, allow the product to sit for 1-2 minutes. Rinse hair thoroughly. My hair came out so much that I had a ball of hair each time I cleaned my bathroom floor. My hair came out in my hands just taking water out of it in the shower. My hairbrush was always full of hair.This product works extremely well. I noticed a change within the first week with losing less hair during the washing and drying process.After just a month of using the product, I lose a more normal amount of hair when brushing, washing and blow drying.